Nowadays Jio is the most popular mobile operators in India but Airtel, Vodafone, BSNL, Reliance are give us new data plans. These plans for more data users who use monthly 3GB or more than 3GB data. These 3G data plans is good and their 3G speed is not bad for internet daily users. Sometimes 1GB data is not enough for one month, then we need more data. 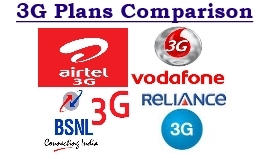 So if you want to use or need 3GB 3G data or more than data per month then you fallow this comparison of best four mobile operators data to choice for your need.